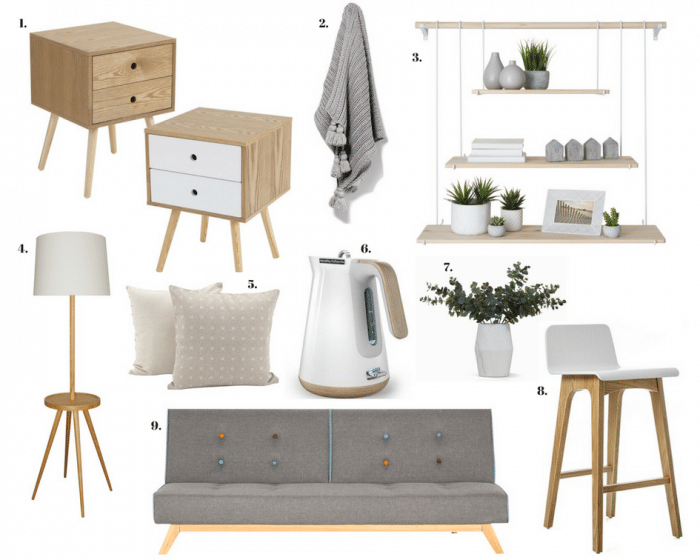 With its clean lines and neutral colour palette, the Scandinavian look is a style that will withstand the test of time. The perfect mix of nature and contemporary design, Scandi interiors bring a fresh edge to modern home decorating. Shop some of the latest Scandi styles now available from our retailers at Homeworld Helensvale. 1.Kent Bedside Table available from Pillowtalk ($79 each), 2.Mercer & Reid Piper Throw in Zinc available from Adairs ($119.99), 3.Habitat Byron White Hanging Shelf available from Pillowtalk ($89.95), 4.Haines 1 Light Floor Lamp in Ash/White available from Beacon Lighting ($295), 5.Margherita Cushion available from Vast Furniture & Homewares ($45 each), 6.Morphy Richards Scandi Aspect Kettle in White available from JB Hi-Fi ($159), 7.White Marble Vase available from James Lane ($299), 8.Home Republic Matt Counter Stool in White available from Adairs ($249.99), 9.Siesta 3 Seater Futon available from Fantastic Furniture ($299).